A shopping cart in php will be a good example for learning. When I started using PHP, I began like most other people; the basics. 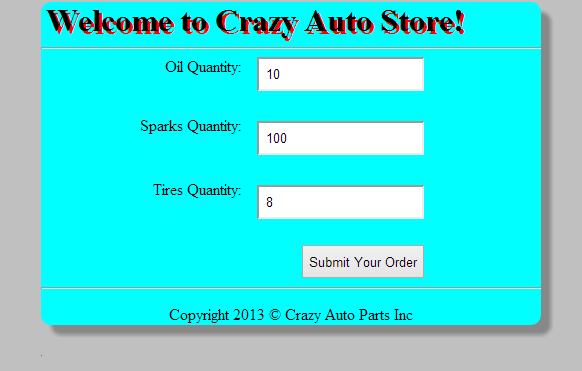 I then promised to show you how to create a simple shopping cart. I have to warn you beforehand, this is not really a complex version. I figured it is smart to start with a simpler version then add more functionality to it as we proceed. So, let us get to it. I am going to do this in reverse, that is, show you snapshots of the cart then dissect the code. So, here we go! Yeah, when I said it was going to be simple, I meant it. Now let us take a look at both the HTML and PHP that made the above possible! That is the html file (store.html). As you can see, I linked an external css file for presentation. Now that we have got that out of the way, we can look back at the first snapshot and see where it came from. Let us get the PHP file started. You might have noticed a couple of things: isset() and $_POST. I used the isset() method to check whether the values of (oil,sparks, tires) are set in the $_POST array. So I have already answered the ‘what is the $_POST’ thingy. When you click submit after filling up the form, the data you entered is stored in that $_POST array, that way, you can access them later and do some calculations or magic! 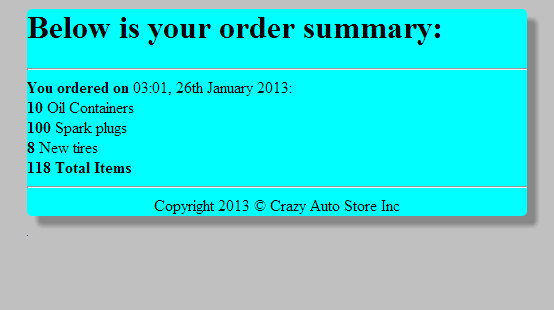 Next time, I will be building on top of what I did today, to add more functionality to our shopping cart in php! Think about shipping, discounts and more stuff! I hope to see you around and if you have any questions, please let me know and I will be glad to talk to you. Take care! Please share this post if you liked it and let me know if you have any comments because I would love to hear from you! Please subscribe to more great posts! Place the inputs inside the labels. If you really require them outside, then use it properly. The label@for requires an id, not a name. Use an id of the input element it refers to. Just… don’t make copys of variables without need. Great points thanks. About placing inputs outside the labels, I have not seen that kind of thing before. Perhaps I should give it a reading. Either way, much appreciated!! You just did. But you didn’t do it properly. BTW, if you are doing it in HTML5, then do it better to suit the HTML5 itself!